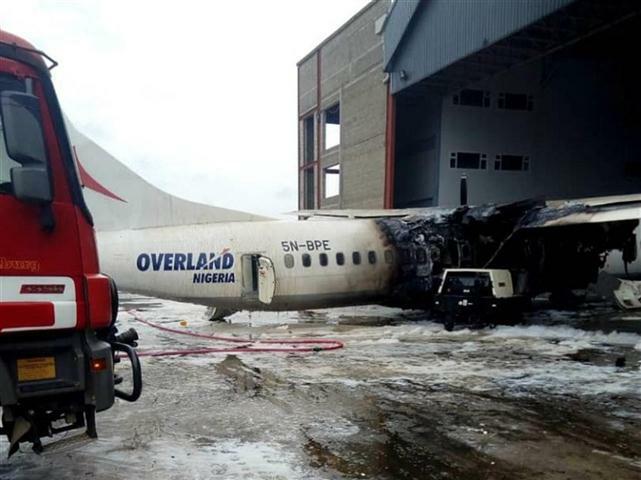 An aircraft in the fleet of Overland Airways has caught fire at one of the General Aviation Terminal (GAT) hangars of the Murtala Muhammed Airport, Lagos. The aircraft caught fire, Friday 12th October, while it was connected to the Group Ground Power Unit (GPU) of the Airport. It was gathered that there was explosion as the aircraft burned, sending splinters all over the airport. Fire services successfully doused the fire, though the plane reportedly burnt beyond redemption. As of the time of filing this report, the corporate affairs unit of the Overland Airways has not issued any statement concerning the fire incident.